The Kid's Explorer Set lets children catch and learn about insects without harming them. Squeeze and release the handle on the Critter Catcher to surround and trap a bug—soft interior bristles won’t harm it, while heavier outer ones help keep it inside. Release the handle to set the bug free outside or in the included jar. Dimensions: 17.5" x 8.25" x 3.25"
Just what I needed !! Bought this as a last resort, as running terrified out of the room has become difficult, since I now walk with a cane! The Critter Catcher has worked marvelously!! I'm actually no longer phobic about spiders and other creepy-crawlies. Haven't tried it on mice, yet...probably not a good idea. But if someone from Critter Catcher Land wants to make a more "heavy-duty" type, I'd be first in line to buy! Whether you’re deathly afraid of crawly insects or an avid believer in their right to live, this handheld bug catcher is for you. Squeeze the handle to open the bristles, release to grasp the bug, and squeeze again to free it—somewhere outside, we presume. The firm outer bristles help grip larger bugs (beetles, spiders, and even scorpions). Inside, the soft nylon bristles keep even smaller bugs safe. With the long handle, you’ll enjoy a comfortable 25-inch distance from the critter. And that length also lends some leeway to grab insects in hard-to-reach spots. Tony Allen designed My Critter Catcher for his afraid-of-spiders son. Because spiders are helpful predators who get rid of other pests, Tony wanted a non-harmful way to catch and release. 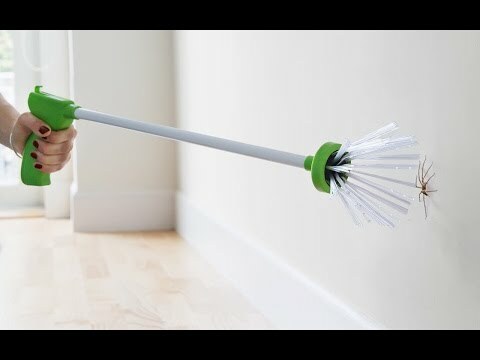 This invention lets you declare “long live the bugs” and “keep that thing away from me” in one combined sweep.